K Money Mastery Review: Make Money On Amazon! Last updated on February 16, 2019 By Nat 38 Comments This post may contain affiliate links. We appreciate you supporting Rags To Niches! Full disclosure here. K Money Mastery Review: Is K Money Mastery A Scam, Or A Legit Self-Publishing Course? K Money Mastery, (Or Kindle Money Mastery) is a course designed by super blogger, author, coach, internet marketer and entrepreneur Stefan Pylarinos, (also goes by Stefan James). I’ve personally purchased this course and have gone through it, in its entirety more than once. In my K Money Mastery review, I want to consider whether selling self-published books on kindle is still a profitable venture and is it still worth purchasing the K money mastery program today – several years after it was first released. Stefan wears his heart on his sleeve, he’s a genuine guy and I admire his story and determination – but does this product do him justice? K Money Mastery – Review In Brief! Overall Rating: Legit! K money mastery provides amazing value, for anyone interested in self-publishing their own ebooks on the Amazon platform and making a profit. If you want to make a success of kindle publishing in 2019 though, I’d recommend you already have an audience related to your niche already. Such as a blog, social media following, or YouTube channel; so that you will get a head start in selling your books and being able to promote them to an interested audience. If you don’t already have a platform start building one here. There’s also a 30 day money back guarantee, so, there is nothing to lost and everything to gain by checking out this training. Learn more here. What is K Money Mastery about? K money mastery is a course designed how to teach you, step-by-step how to create, outsource content for and make money from selling kindle books on Amazon. First of all, there is no doubt that Stefan has made a great deal of money on the Kindle platform. However, Amazon has evolved over time and the game is regularly changing, the competition on kindle continues to grow. Since Stefan first started selling books, the landscape has dramatically changed. However, Stefan has updated the program and continues to do so – he strives to keep up with any changes within Amazon and inform his members. Stefan continues to add new content to the course as and when it’s needed too and any past members can benefit from future improvements. The competition has increased dramatically and kindle has cracked down on people trying to cheat the system – so, you need to have your head on your shoulders. If you put out badly written drivel, you’re going to get bad reviews. Too many bad reviews and your books will sink into an oblivion, so don’t go into this thinking you can just chuck out anything and be ok. Even if you don’t have bad reviews, you need a good strategy to keep generating sales, you can’t just sit back and hope for the best. But that’s OK! Stefan’s course does go over how you can generate reviews and promote your book. This isn’t a writing course and is primarily focused on the idea that you’ll outsource the writing… but plenty of Stefan’s students do write their own! This is not about getting rich from publishing one book, this is a numbers game. You put a lot of books out there making a little bit each month and that amount adds up the more you have – you may also do well and get some books that make you a very decent amount each month. Stefan targets non-fiction books primarily, but has expanded the course to include some information about people who want to target fiction too. You can certainly apply Stefan’s method to writing fiction, or children’s books but the process is slightly different. Stefan has a video going over how to search for a niche in the fiction market. It is suggested that, if you’re outsourcing, you will probably have to pay more to find a quality writer if you’re focusing on fiction. That said, the market is huge and there are plenty of opportunities. You find a profitable niche in kindle. You look for low competition keywords you have a better chance of ranking for, (but ones which are still profitable). You come up with your title. You outsource, (or write) the content. You use various methods to get reviews for your book & promote it. You start over again with a new book! The aim is, to build up your catalogue of books and gradually your profit. You learn via video tutorials, you also have a PDF file accompanying each lesson, that it is also suggested you read. There are 21 key lessons, but within each lesson there are often more than one video. Choosing a title that sells. Preparing your book for publishing. Marketing your book on KDP select. Using twitter and facebook to promote your book. Boosting your amazon keyword rankings. Setting up your amazon author central account. Creating a series of books and monetizing the back end. Scaling up your kindle books and making more money. How to make your books profitable long term. How to track, manage and optimize your kindle books. There are also useful bonuses, such as how to create a corporation for your business, accounting basics and tax requirements for non-us residents. He also has a decent list of helpful resources and programs that can be useful. useful list of places to submit your kindle book during your free promotion, (a great opportunity to get lots of downloads and reviews for your book). The key upsell for the course is – the Full Disclosure membership, $67 a month. Which while may be valuable to you later, is something you can purchase at any time and is not compulsory. I have recently heard some great feedback from full-disclosure members, so you may want to check it out. There are occasionally other upsells as you enter K money mastery, for things relating to his other courses, such as how to write a book in 24 hours, but none of these are required. Click Here To Check Out K Money Mastery! What is full disclosure membership? Full disclosure gives you access to a large library of extra advanced training, which is regularly added to. You’re taught extra methods to advance your business, such as how to publish a physical book in create space, publishing on other platforms, marketing tactics and much more. Plus you have access to a private mastermind facebook group, where you can get review exchanges and ask for help. I think full disclosure sounds awesome and in my opinion and will include plenty of helpful advice that you’re likely going to need to become successful on kindle now, (it’s also added to regularly). If you are really serious about kindle publishing, it’s an option to consider – and you can always join full disclosure at a later time. I have heard from disclosure students that having that additional support and training has been worth the extra cost of the monthly fee. Stefan suggests outsourcing a small book to begin with, around, 5000 words, (20-30 pages) This is incredibly short. While this may be ok for certain topics, looking at reviews online it seems a lot of people do complain about the length of books like this. but too many people going through kindle courses end up putting out complete trash hoping to make a quick buck. I had heard through the grapevine that more people were aiming for 10,000 words plus and this may be something to consider. But the most important thing is just to take action and get your first book out there, you will learn as you go along. It’s just worth knowing from the start, that once the true reviews from real buyers start coming through, 1 star reviews will start piling in if your book is not up to scratch. Even reasonable books will likely get bad reviews somewhere along the way however, so you have to prepare yourself for that reality. You need to find ways that you could overcome the negative reviews, (improving on your book for example, which is something Stefan suggests too). Stefan suggests first spending around $100 on your first book, while that may not sound much – I’ve personally seen many talented writers to be found on upwork on a budget. If you do decide to go ahead and write your own books though, there is still an abundance of information on K-money mastery that you will find useful and beneficial. 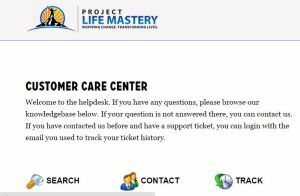 Support is limited to filling out a contact form, or searching to answers for common questions. Even though Stefan’s videos are very straight forward and step-by-step – I did occasionally still find myself having questions. If you’re going for the regular membership, then this is the only place where the course falls slightly short. There isn’t a community that you can go and call on for help. This is where being a full-disclosure membership certainly has its major benefits. However, there is a large amount of previously asked questions and answers that you can choose from. If you’re a full disclosure member, any questions you have could easily be answered in their private Facebook group. Additionally, there are lots of extra advanced videos available to full-disclosure members that are updated regularly. If you join the course and decide publishing on kindle is definitely something you want to do, I would consider joining full-disclosure. There you can take advantage of review exchanges, the additional advanced videos available and the support from the Facebook group. But you may discover the benefits of being a member quickly outweigh the cost, especially if you start making a decent profit from your books. K money mastery: Key things to remember! Kindle is ever changing. You can’t just put out rubbish books and hope to make money. You need to have decent books that provide value. There is an ever growing rate of competition. Therefore untapped profitable niches, (particularly in non-fiction) will be harder to find. You really need to do research within your niche and weigh up your chances at selling well – can you compete with the top competitors in your niche? If you get a huge bunch of bad reviews, all your efforts will be wasted. Gaining reviews for your book is of extreme importance. Stefan covers how to gain reviews in K-money mastery and following his advice here is important. I use a great tool called Kindle Spy to have a peek at some potential self-published books. Kindle spy is an excellent tool for finding profitable niches and makes the whole process so much easier. You can spy on how much authors have made in the last 30 days, which can really help you decide not only what topics to target. The tool also has lots of other helpful features. It’s quite easy to spot books created by those who have gone through a program like k-money mastery. look for books with several keywords in the title. look for book length between 20-30 pages. look at the at the number of reviews and the price – you want to find books that you can compete with yourself. So, using kindle spy, one of the first books I found, (see image below) was in the depression niche. The book was released in Dec 2015, 29 pages, 21 reviews all 4 ad 5 stars, selling at the moment for $2.97. No, this kind of income going to pay the bills but simply creating one book is not the aim here, your aim is to create lots of books – some may make nothing, others will make more. The great thing is, while you may be spending some time promoting these books and gaining more reviews, a lot of the income you make will be passive. Passive income is certainly something a lot of people out there are looking for! As you can see, kindle spy can help you research things very quickly and can definitely give you an advantage starting out. 5 books $11 in 30 days total…. and it continued on and on like this until…..
Hmm… see the result that sticks out right there? This was an unusual occurrence, but sometimes it would seem that very similar sorts of books, would suddenly be selling loads more than others. One very good reason… these authors have either a website/blog, or simply an email list! People self publishing lots of non-fiction books on kindle AND making decent money, will usually have a website or blog that they will be both driving traffic too and also from. Alternatively, inside their book or via their authors profile page, they will have a link to a”freebie offer…” (such as a free book or report). If people click the link to this enticing freebie offer, they’re directed to a squeeze page, where they fill in their email address. The author can then inform their email list whenever new books come out. Over time, you can see how promoting your book to hundreds or thousands of people who are already interested, can be incredibly profitable. So, it’s definitely wise to work on building up a dedicated following over time and this is something you can think about once you’ve put a couple of books out. Having a platform and an email list gives authors a far superior advantage above those who do not. So, go into kindle publishing with that knowledge in mind. To have the best chance of success, you need to have your marketing hat on. Having a freebie is a good idea, having a website or blog to direct people to is a good idea. You need to try and provide as much value as you can and make your books stand out from the rest. So, Who Is Making A Killing On Kindle? There are examples of bloggers currently making a fortune from kindle. You may well have heard of Steve Scott – who is said to make something $30k a month selling books on kindle presently, (at the time of writing). Steve’s books are longer, at generally between 100 and 170 pages and he does write them himself. He’s been pretty vocal about the flood of mini crappy books into kindle and I’ve seen him talk about it a lot. Stefan certainly has created a whole movement of people writing kindle books, who are not focusing on quality and that has upset a lot of people. However, of course not all books put out there are poor quality and Amazon has really been working on punishing those who are gaming the system. So, making sure you’re putting out the best books you can, will benefit you in the long run. What can you learn from all this information? Build up a platform via a website or blog in a niche you’re passionate about. Write, (or outsource) quiality ebooks that you can sell to both your present audience and generate a new source of traffic via amazon, directing your new readers to your website. As an extra idea, have a bonus or freebie offer so that you can capture email addresses for future book promotions. I know Stefan goes into a great deal of detail about monetising the back end of your kindle books in full disclosure. What If you already have a website/Blog? If you do have a popular website or blog, Kindle can really help you expand your business. Writing about something within your niche means you can generate a whole new audience of people who are looking for relevant books on kindle. You can also drive sales to your book from people who already visit your website and who are on your email list. Looking at various Fiction authors, there was a difference- I didn’t have to look far to find self-published authors selling huge amounts of books in the fiction area. I haven’t read the stuff, so I don’t know how good or bad it is, but there is certainly a load of it selling – romance and erotica is particularly hot! I have heard of many authors outsourcing fiction writers too, as well as those who write themselves. In fact, some people have created whole kindle empires with fiction online – without writing a single word themselves! The children’s book market is also booming and is something I have been looking into myself. In fact, I had some amazing illustrations done by someone I hired from Upwork. or you can attempt to outsource for a fairly reasonable price, (you’d need to do look carefully for a decent writer). Stefan recommends “write articles for me” but I have personally had quite bad experiences with them, (so far). I prefer working with Upwork where you can post a job and normally get a large number of applications that you can go through yourself and you can also engage with your writer and build up a proper working relationship. to produce a book that is excellent quality and promote the hell out of it! then, ideally have a freebie offer as an extra perk for your readers! Follow all the techniques Stefan suggests in his course as far as promoting your book, get as many reviews as you can – then your book will have the greatest chance of success. Most people do not get as far as publishing a book in the first place. The feeling of actually putting something out there for people to buy is pretty exciting —so, make it something that you’re proud of. 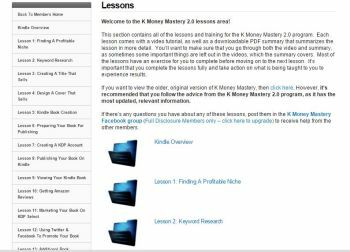 K money mastery review: is K money mastery a scam? I’m sure you know where I stand on this now after getting this far into my review…(really, thank you for sticking this one out, I know I had a lot to say!). K money mastery is not a scam, it’s a high quality, in depth program to invest in and provides great value for money. If you have any interest in self-publishing, this course will benefit you. Like I said at the start of this review, I purchased this program personally & studied it all. While I don’t intend to go down the route that Stefan suggests as far as outsourcing the writing aspect, (at the moment) there is still tonnes of valuable information in this course as far as simply creating your own ebooks. Once you’ve paid, you’re a member for life. Whenever K money mastery is updated, you will be included in on those updates. Members of K-money mastery 1.0, are also members of K money mastery 2.0 and so forth. I feel joining full disclosure too, even if only temporarily, could be very beneficial – but certainly isn’t compulsory. As you can gain so much insight and advice from people already successful within Kindle publishing. There are no ties to full disclosure, so you can always leave at any time and there is a 30 day money back guarantee – so, check out and see what you think. Beyond Ebooks: Building Your Own Platform Online! If you’re interested on building a platform in order to monetise the back end of your kindle books, check out this training platform. There you’re taught how you can build a website/blog in any niche you choose and then you’re taught how you can generate an income from your website in various ways – primarily via affiliate marketing. Everything is taught from scratch and is suitable for complete beginners. It is also the exact same training that I followed myself. Are you a kindle author making a killing on kindle? Or have you suffered from dwindling sales? I’d love to hear from you & hear your stories! Leave me a comment below! 40+ ways to earn your first dollar online. 14 ways to earn from a WordPress website. Wow I was impressed with the very concise review you did of the money making program surrounding one’s making money by first writing and then selling books on Kindle. I especially liked the fact that you presented such a complete analysis of this program created by Stefan Pyalrinos. It is true what you say that many people would try and make money anyway they can and through the possibilities that exist at Kindle, write books. It’s not as easy as everyone makes it out to be, a fact that both you and the author of this program Stefan clearly state. The main problem is that with so many books being published weekly, a lot of them are junk as people have such mediocre writing skills. I know that the author concentrates his program mainly with non-fiction publications, but do you see the possibilities of a person having success at writing fiction, mystery, romance and other classifications? I did not really like the upsell as part of the program. $67 a month is a lot – much more than is offered here at WA for a lower monthly membership fee. And WA has so many other features – hosting, website building, training classes, etc. that this guy might not have with what he charges for his upsell monthly membership. That’s just me however and as you believe you have gotten so much out of purchasing the upsell, there obviously are positive factors to it. I also could note, looking at other post articles on your site that you really excel at writing, Nat. I also checked out your review of Afflilorama as I also studied that program in an article posted on my site. Speaking of upsells – $797 for them to help out in devising a “can’t miss money making” marketing system for me? No thanks I’ll pass even though I thought that the regular program at Afflilorama itself is legit. Although not better than WA! Hi Jeff, thank you very much for taking the time to write this thorough comment – and for your compliments! I really do appreciate that. There are certainly possibilities with fiction books – I’ve done a lot of research with kindle spy and the results some people are getting with their self-published books in fiction is astounding. A lot of the writing is not brilliant either, so I think there’s certainly plenty of room for people with some talent to get in if they’re dedicated. The upsell is expensive, I agree. But I think it may be useful to some people – temporarily – to get reviews when publishing at least their first book, until they build up a list. It is a monthly payment, which you’re not tied into. I agree as an overall monthly membership, Wealthy affiliate is offers a huge amount – but if you’re looking at just self-publishing, there is quite a learning curve with that too and it’s different to IM courses – although knowing about IM is incredibly important and beneficial, (I believe) if you want to be very successful with self-publishing — due to the benefits of having a platform/list and so on. I really appreciate you complimenting my work, thank you. Totally in agreement there with affilorama too – I think the free material is great, but the premium membership does not stack up. This is a very timely review, I’ve been researching kindle ebook publishing for a while now and I’ve been considering on writing my own ebook too. It’s true, selling your ebook can get a a ton of profits, it is like your online asset and it is my dream to do that and K-Money mastery sounds really awesome like the perfect program for that. I have o admit the topics inside like keyword research and Facebook promotions are all things that I’ve already knew but I guess it doesn’t hurt to give it a try. Thanks for taking the time to review this, much appreciated! You’re welcome Riaz – I do think it takes some extra effort and different methods to be successful now, but I think the program is value for money and worth having. I hope you benefit from it and have some great success! I have recently seen ads around K-money talk and I continued to look into until now. I’ve finally come across a decent and genuine review of the product. Why couldn’t I find this website to begin with haha. Creating, outsourcing and promoting content is of interest to me and that’s how I heard about K-money. Thanks for the helpful review! Great Ben, you’re welcome. I think a lot of people go into it thinking they can just produce these short books of little value or quality and make big money – while I think some people did certainly get away with that for a while, the game has changed now. There is much more competition on kindle, you need to produce good content, but ideally you do need a platform to direct people to from your books – a website or blog where you can give away something for free and build an email list of potential buyers for future books! I met an Asian guy about a year ago who had made a real good killing out of outsorucing articles and putting them together for a paleo cookbook. He paid about $4 for each recipe to be written out in unique content then threw about 15 of them together to make the book. Unique book written within a week and he’s still making around $300 a week off it even now! Well worth thinking about really isn’t it? Wow chris, that’s amazing. Thanks for sharing that. I didn’t think about outsourcing for recipes, but that would be really simple to do. It’s so cheap to get started, there is every reason to give it a go! Thanks for your comment! I’ve been interested in producing a kindle book myself and I’ve actually typed out or summarized a few bits from my blog, yet I’ve never finished it because I wasn’t sure how to publish it for optimum conversions. Have you had much success with selling books? Would you recommend the program k-money mastery, or would it be a bit of a waste of money? I actually completed the course a while back and have a couple of ebooks ready to go – but I actually wanted to write children’s books. I wrote the books and outsourced the illustrations, (very successfully, I found a great artist who did an awesome job for a reasonable price). But then I got sidetracked with other projects and am still waiting to publish. I can’t comment much on purely outsourcing and putting books out that way, because I intended to write books for the most part. However, even though I haven’t followed the program exactly as intended, I can say that it contains all of the information you need to get started on kindle, just from starting your book, outsourcing, formatting your book, publishing and getting the most from gaining reviews/promoting your book and so forth. I don’t think it’s a waste of money at all, I know that I always have it to go back to each time I do publish a book and it’s a very useful tool to have at your fingertips whenever you need it. I also highly recommend kindle spy for researching your niche/competition first before you choose an area. That said, I do feel that in order to gain the most from publishing, you really need a platform now in order to do well – or at the least – a freebie on offer in order to gain email addresses, so you can sell to people later on. Many thanks for your comment! I actually downloaded half of this course from a torrent site – of course at the time I thought it was the whole thing, but I was unaware it was a membership area based education. Still, the start of the course saved me about $7 and it was actually full of pretty decent info. I would like to see the whole course based on what I learned about his product so far! Hey chris! Oh I didn’t realise there was that offer. You can actually trial the whole course for a week for $7. If you click the link above and then click away, the offer is there. It’s well worth having the entire course – once you have it, your a member for life and through any upgrades, so it’s worth the money. I’m seeing a definite trend in all arenas of internet money making towards quality. Which is definitely a good thing, though it can make it tough for people to get started. No one is perfect straight out of the gate. It sounds like this program can teach you how to improve with each book, which is certainly a good thing. I like that they are up front about how much an individual book will earn. It is definitely a Numbers Game. I also think the way of the future will be to focus on building a readership who look forward to read your work, what do you think? Hey there – yes it is quite shocking really size wise, however it seems the trend is more towards slightly larger/longer books now and the need for quality is paramount. Additionally, building up a following is definitely the way to go now, whether that be through email marketing and building a list, or having a website already and using ebooks to build up an additional traffic source, as well as income stream. There’s a lot of potential with kindle, that’s for sure. As a writer myself, this post really resonates with me. Really an excellent summary on how the landscape changed when it comes to Kindle. Really, I think a lot of this applies to the digital age and Internet marketing itself. But one thing that clearly hasn’t changed over the years is that content is still king. If you want to be successful on Kindle or somewhere else, you’ve got to put out the good stuff. Hi Mike, thanks for your comment – absolutely! The landscape is constantly changing and will continue to change over time with kindle, so it will be interesting how self-publishing will evolve! Certainly, at the moment, the potential is massive. But the potential for people who already have some internet marketing knowledge is considerably better – because if you already have an audience, or the potential to grow a list from your readers, you can have a great advantage over other authors who do not. You can also use your books to drive traffic back to your website, if you have one. Thanks again Mike. I remember from months ago reading another article at your site and I remember that you were into writing books. Therefore what a distinct pleasure it was for me to read one of the most comprehensive reviews of a business opportunity, (other than those written about WA – and really there have only been a handful) I have ever seen. I was wondering why initially he only concentrated on non-fiction? He recently went into teaching the techniques for books in the fiction genre, but that still leave out a lot of niches regarding categories of books – mystery, (my favorite which I feel is different from just “fiction” as a whole), romance, business, music, art, etc. Yes the $67/month full disclosure membership fee is very steep. Although Mr. Pylarinos does offer many other tools in comparison to what you’d receive at the basic price. You still only graded it out as an 85 on a scale of 100 Nat. You know a heck of a lot more than I do about writing as a profession so undoubtedly while the program appears to be good as judged by me, you obviously feel there could be some improvements to allow it to be graded up to an “A” level. Hi jeff, thank you for your in depth comment here and I really appreciate you taking the time to write. You ask some very good questions!! 1) Why does Stefan concentrate on non-fiction? Stefan thinks it’s easier to start on kindle with non-fiction because it’s easier to outsource writers for this – he would say, that an average writer may be able to write a good non-fiction book, as long as they’re writing plenty of good information in there that is beneficial to people, whereas with fiction, you really need a great story and there are many other factors involved in ranking an non-fiction book – so it’s not straight forward. It’s also easier to figure out what keywords to use for a non-fiction book. Basically, he just thinks you’ll have a higher chance of making sales if you start off in non-fiction and that it’s easier to do so as a beginner. The fiction market on kindle is HUGE and I know of self-published fiction writers making $100,000+ and more every month, (you can spy on some of these authors using the kindle spy software I talk about). So, it’s certainly something to look at ..whether you’re writing your own books or not!! The thing is, it’s so cheap to get started on kindle and you can create multiple pen names, so you are really free to experiment if you want to commit to it. 2) why did I give it 85 out of 100? This was a hard decision for me – I really rate this program and I think it’s more than worth the money, but I think it’s a shame that the full disclosure is not included. I can see that many people would find $67 a month too much starting out. So, I’d like it if the overall training was a higher price overall but that it could include full disclosure… or something along those lines! Either that, or a lower monthly payment, (such as the price WA currently is!). I also think that more information for people wanting to write their own material and go into fiction or writing kids books could be included. (There are some self published authors making a huge amount writing kids books – and frankly some are awful!!! Lots of space for some decent books to be created there!). Lastly, Stefan’s course and others like it started a movement of people who tried to “cheat kindle publishing”, by writing really terrible, really short, horrendous books. While I don’t think this was Stefan’s intention, this was the result. Now Amazon is clued up on this and it’s getting better, you can’t get away with chucking out rubbish and making a tonne of money – you may make a bit, but it won’t last. Stefan really does emphasise that the books should be high quality – but many also say they need to be longer too, 5000 words is more of an essay, not a book. Stefan continues to update this program regularly, so I imagine improvements will be made as time goes on too and the amazon landscape continues to change. Thanks again for your comment! Writing a book sounds exciting because the simple fact of seeing your name published represents something extraordinary. Never cross my mind to sit at the computer and start writing something because I thought it was always difficult but now it seems that I will get this help as you suggesting. What happens if in the seven days have not finished your book anyway have stuck with the original payment? Great review! I just wanted to say to anyone that is reading this that I’ve been through this course and it really does work. I’ve managed to build my income using Kindle Publishing to the point where it has overtaken the income from my day job. I want to stress however that it is not a get rich quick scheme. It took me almost 18 months of working 3-5 hours per week (in my free time) to get to that point. Thank you. Yes, it was mostly non-fiction. I have, dabbled with fiction but I found it to be quite hit and miss. Out of the 7 fiction books I have, 3 make money and the other 4 don’t sell any copies at all. I have a better success rate with non-fiction so I decided to stick with that instead. Are you in affiliate with K Money Mastery? Hi – do you mean am I an affiliate for k money mastery? Yes, I do promote k money mastery, however – I also originally purchased the program and took it completely, more than once. Anyone can promote it via Clickbank, if they wanted to – you don’t need to have purchased it to do so. Hope that answers your question, thanks. WOW! What a wonderful review! I have read through it several times, and I actually signed up with your link several days ago. I am an (unpublished) author, now on the finishing chapters of a 120,000 word novel. This has actually taken me several years to write, due to a number of reasons which I shall not bore you with. I am going to sign up for the ‘Full Disclosure’ in the near future, as it certainly looks like the icing on an already very tasty cake. Regarding Kindle Spy, (which looks amazing! ), I have one question: When I click on the link, it suggests an additional purchase of KDROI software for $29. This also looks good, but do you personally think it’s worth it? And my second point is that, believe it or not, I have neither a website nor a blog, and quite frankly don’t know where to start. Any advice on how to get started would be so much appreciated. It’s never too late to learn! Hi Tim, thank you very much – I appreciate that and am pleased the review has helped you. sending your book to these sites is very time consuming, so at $29, it certainly looks like a good deal. Many thanks for such a swift and helpful reply! Much appreciated, and I’ll let you know how things go! I have tried K money mastery before. My opinion is that you can learn many things if you are a beginner on online marketing. But many of their promises are totally unrealistic. When you say that you can earn 10k or 50k dollars per month, the visitor expects to happen from the beginning. However, it is a business model that starts really slow like the most legit models. Hi Ilias…there are many routes you can go for sure and this is just one of them. Too often the promises are unrealistic and over inflated and you have to try and ignore that for the most part. Even in legitimate programs, they can tend to pile on the earning expectations and make it appear a lot easier than it really is. I totally agree, when someone starts saying you can earn tens of thousands a month in a certain amount of time – it all seems far too easy and then there is a expectation there from the start, where as people underestimate the work involved. That’s a valid question and I think the landscape has certainly changed dramatically as far as making money with kindle. It’s not like you can just throw up a few books and make money. That being said, some people are still doing extremely well. The way I think it can work best now though, is if you already have a following online. So, if you have a website in a certain niche and a good following, then putting out ebooks can be a great thing to provide to your current audience, but also as a way to build your email list and your traffic to your blog as well. As you can add links in your ebooks to your blog. 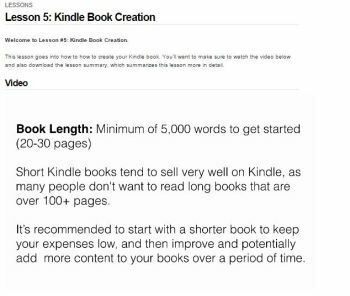 All being said, this training has been updated and continues to be, I think it’s a good value product to have if you’re considering creating your own kindle books, as it really goes in depth into the process, as well as how you can market the book, get reviews and much more. Thanks for the in depth review! I’m doing this program right now and I’m a bit puzzled which writing service I should go with for starting out. I want high quality books to be written, not some mediocre stuff. The books I have in mind need specific technical knowledge too. There is Upwork, Write Articles for Me and Writers Mastery. You said you liked Upwork, but to me that sounds much more hassle and risky than going with an established company. I mean I can potentially find a good writer… or it might take a lot of trial and error until I actually do find the right one. What do you think? You mentioned that you had bad experience with Write Articles For Me. Can you elaborate please? I was just about to order from these guys, but now I’m not sure. Do you have experience with Writers Mastery? Do you have some tips on how to ensure the books I order are of high quality? A platform where you can directly speak to/interview your own writers is the best option in my opinion. You can see their previous work, you can give them in depth explanations of what you want and you can get them to edit your writing. Possibly most importantly, you can build up a good working relationship with them. The problem with these writing companies like write articles for me, is you’re not directly in contact with the writer, like you can be hiring your own. Often the information you give is wrongly interpreted, (in my experience). I had articles written with writers for me and the work I got back was really poor. It was badly written. That’s just my own experience though. If you want to try them, I would start off with a small project and see what they are like. It has been a very long time now since I tried them! I don’t have any experience with writers mastery. If you want a high quality book and you don’t want to write the book yourself, your best bet is to hire a writer who already has some experience and knowledge in the area you’re looking to write about. You want them to be able to research the niche effectively too and not just churn out copies of what other people have already done. You may want to purchase some of the best sellers on kindle in the niche you’re going for and see what sort of standard these books are, how many words they are, whether they have many images and so on. Yes. It helps, thank you! Can you recommend a good forum or facebook group that is free or inexpensive to join and has relevant information for Kindle Publishers? Hi, I found the free Facebook groups were full of spam, I found them too chaotic. I’m sure some exist that are good and free, but I don’t know of them. Not sure if you have checked out the full disclosure membership – obviously they do have a FB group – but it is a monthly fee. That being said, I’m sure even joining temporarily could be beneficial. Good luck to you.